DJ Ceremony was an established wedding DJ before joining Stylus. 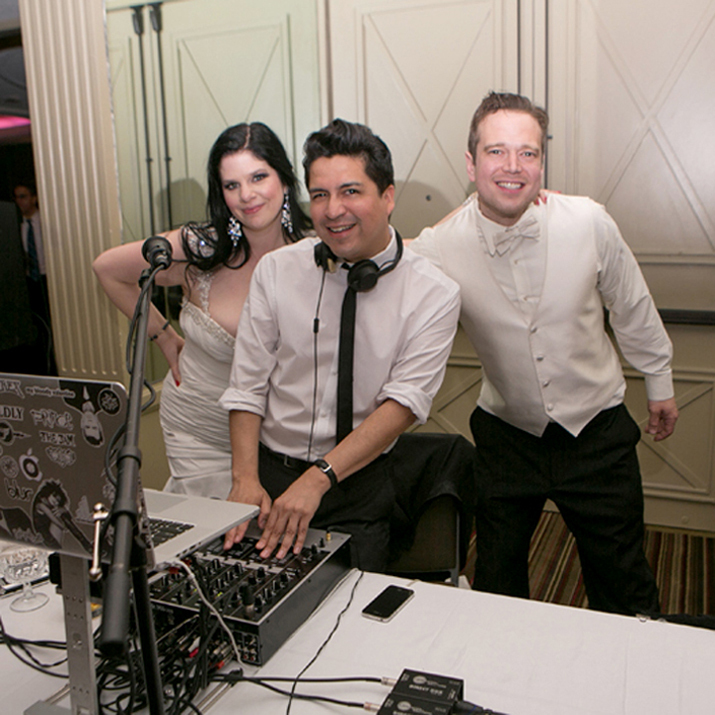 DJ Ceremony is a seasoned DJ with over 200 weddings under his belt, dozens of corporate/non-profit events, in addition to hundreds of club gigs as DJ/event producer, or as a featured DJ. ‘Like many people, I became interested in music at a young age. Growing up I would always spend a lot of one-on-one time with my mother, who in the ’80s was heavily into British New Wave, Synthpop, and the English New Romantics. She was the one who introduced me to bands like XTC, OMD, and New Order for the first time. In retrospect, I realized that my mother had a huge influence on my particular sensibility in sound! Apart from my wedding and private event work, I produce & DJ an NYC-based Smiths & Morrissey fan party called “Oscillate Wildly,” which has been running since 2010. I also produce a variety of Britpop, New Wave, and Alternative ‘80s-themed nights held all over NYC & Brooklyn. My wedding & private event style is highly collaborative. I put a style spin on every event that I do, but definitely not to the point of imposing a specific music-style on any event. Instead, I really enjoy creating a customized sound for each and every event, tailored to the musical tastes of the clients and their guests. I’m very detailed in nature, so you can be sure that every bit of information that is communicated to me makes its way to impacting the final event. Customizing each private event so that no two sound the same is what makes doing them fun! Playing the same material everywhere I go (even if it worked) would be super boring to me. I use a multi-channel DJ mixer in conjunction with Serato DJ software running on a Mac. I use QSC speakers and subwoofers, with wireless and standard mics for use for client/guest speaking and my personal MCing. Over the years I’ve become very comfortable on the mic. It’s a pleasure to help guide an event along using MCing, however it’s not my style to be a “hype-man” on the mic when it’s not necessary, as I feel like that sounds a bit cheesy and outdated. My MC style is minimal. I enjoy beat-matching, or blending songs together when possible. However… when I’m faced with a choice between picking a song that will beat-match with the current one, and playing a better song, I always choose the better song. Beat-matching is a fun technique to show off, but nothing is more important that using the best material for every given moment, that is always the overriding priority. I don’t generally experience lulls on the dance floor once the party gets going, but if one does happen, I can remedy that by shifting to a more “tried-and-true” song that has broader appeal. Over the years I’ve developed a sense of what songs never fail to excite people, so I can always reach for one of those in a pinch. How did you get started DJing, and specifically weddings? I started DJing in 2001, by chance. Back then, I would look in Time Out New York for parties that played ‘80s Alternative music, and when I went to one of my favorites one week, the usual DJs were nowhere to be found. I inquired, and the staff explained that those DJs had stopped doing the night. They then asked me I was looking for a gig. I accepted the offer, even though I had never touched a DJ mixer before! My first night was a smash luckily, and that was the start of my DJ career. The first wedding that I DJed was in 2009. I love the drama of a wedding, and the specialness of them… so they are a real joy and are exciting to play. When I’m not DJing, I work in the visual arts. My college degree is in graphic design, so I do design for a few private clients’ businesses when time allows. with DJ Ceremony before deciding?